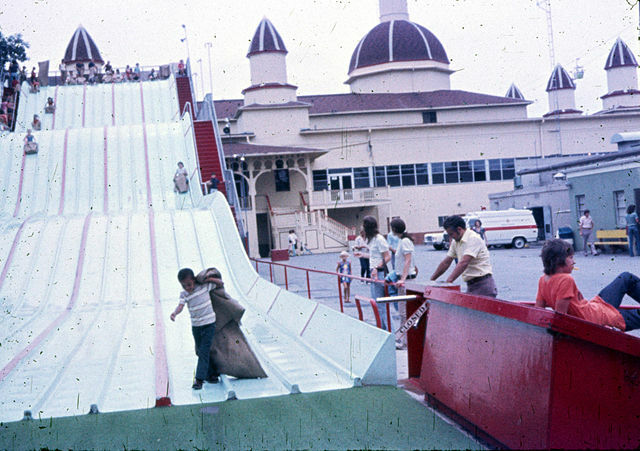 The Sky Slide was erected in 1968. I thought it was amazing. 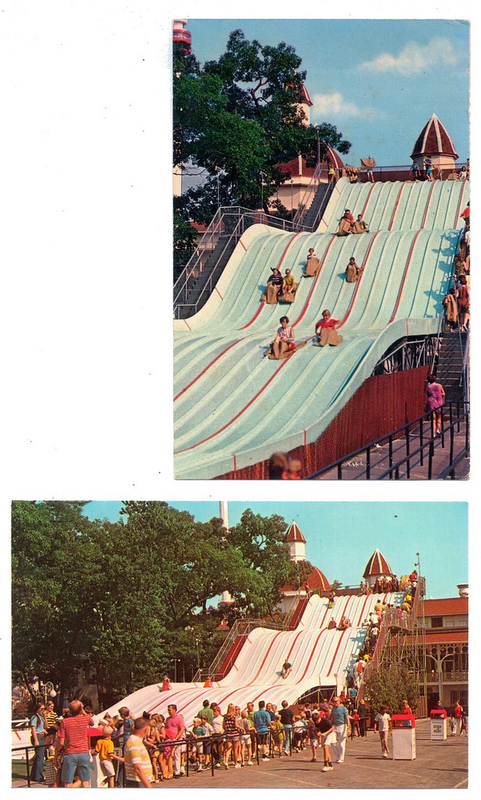 It was a large fiberglass slide with fifteen racing lanes. Looking at the pictures I would guess it was roughly four stories tall (between 40-50 feet). It was a complete blast that I loved even as a teenager. It was located where Snoopy Land is today. The routine was simple. In the picture immediately above you can see the kid is holding a burlap sack. He is carrying it over to the red bin at the opposite side (which is identical to the bin the guy in the orange shirt is leaning against on the closed side). When you went to ride it you picked up your burlap sack and entered into the turnstiles. You would haul this sack up the fifty-ish steps. I can tell you as a pre-teen, these could be quite awkward since they had some weight to them. Once you got to the top you were assigned a lane and sat down the sack at the top of the track to get ready. Once the attendant signaled the race was on. Your hair was blowing in breeze. You were trying to grab the lane sides to push-off on and give you more speed. This was one of the most important races of my young life. You sped to the bottom and figured which spot you came in. You then would take the sack put it into the red storage bin. The important time was deciding if you were going to do it again. The line was normally not too bad so some days I would just cycle through doing this around five times. I loved it. I would probably rank it as one of my top ten favorite Cedar Point attractions of all time. For younger kids they could ride down on their parents laps. I think I made my parents take turns for a while when I was too young to ride by myself. Somewhere in the lost family albums I know there is a picture of my father and I riding it. I’m sad that the picture is gone. Now let’s not say that things didn’t happen on the ride. There was always the game of let’s annoy the attendant by going before the official start time. Some people would just go by themselves. This could happen a couple of ways. The first is that it was intentional and the person couldn’t contain themselves (or didn’t care about the attendants rule of order). The second was they accidentally started by moving the wrong way. This wasn’t uncommon in younger kids. However, you know when it was a couple of friends (yes I did this often enough) – that is was intentional and they wanted to race and break the rules together. Finally let’s not forget about the friction burns this ride would dish out like large candy bars from the rich house on Halloween. If you were a regular attendee of Cedar Point throughout the season – this ride was the one most likely to give you an injury. Didn’t keep your knees in – well there is a massive burn on your leg. Tried to speed your slide by pushing off the walls to propel you – well your hand lingered a fraction too long – burned hands. I don’t think it was coincidence it was located right next to the first-aid station. I however sucked up my injuries and moved on and never went and got first-aid.